We here at ADK believe the holidays are a the best time of the year! They can be stressful at times as well! Let's take a break from the stress with a fun ADK family friendly contest! From today 12/22 - 12/25 We would like you to make a gingerbread house and upload the finished product with a non blurry clear image photo of your master piece to the special channel located above Fun For All in discord! ALSO: You must include your ADK member name in the photo to prove its legit!! This is open to all ADK members ONLY! Judging will be done by the big man himself.. Yes AOB!! Aww you thought I meant Santa didnt you?!?! LOL He will judge them based on creativity, use of candy, and over all neatness! Judging and Winners will be announced on Dec 26th! Grand Prize is $25 steam gift card! 2nd Prize is ADK Tshirt 3rd Prize is $10 steam gift card! Honorable mention is either a small 1 month ingame perk for either ARK, Minecraft or WOW or your choice a $5 steam gift card. Your choice! Be creative, Have fun, and blow AOB away! @Jaden So Saturdays between 7-10pm.. Does that mean we are gonna all play together this Saturday?!!?!? bout time girl @Aciid Glad your here! Ok just making sure I dont get cyber arrested for getting high LOL Im old and wont quit! @Hye Kyung I appreciate the time and effort you put forth with your post.. @CaGregorio will talk over your suggestions and get back with you.. Thanks for being a member of ADK and welcome back! Hi @Worf55 Join the older Minecraft club.. We dont have very many kiddos who play here at ADK.. Mostly over 18.. Its nice to meet you! General Server, Chat, and Website/Forum Rules NOT reading the Rules will result in a Temp Ban The Rules Below apply to all servers. 1. No griefing - Ever. This means destroying any block placed by another player. No stealing if you find a chest without protection, you are not entitled to take from it. Keep to your own belongings. (This Does not pertain to claims that you have given access trust to.) 2. You cannot claim someone else's things or builds regardless of how long they have been inactive. If you wish to build on the land of someone who has been gone for more than 2 weeks, ask a staff member to verify their absence and tear the structure down. 3. Respect all players and staff. 4. Use appropriate language, do not spam chat on Discord or within Minecraft. 5. No advertising other servers anywhere. 6. Always protect your creations or if it is an exceptionally large build, ask a staff member to Admin Claim it for you. 7. No death traps, including 3x3 holes. 8. Do not build and leave 1x1 towers ever. 9. Do not use Teleports (ex. /tpa , /warp) to kill players UNLESS stated and the party agrees to being killed. 10. If someone feels disrespected by something you say and they ask you to stop, stop. 11. Insubordination will not be tolerated. If a staff member asks you to stop doing something, you stop. 12. Do not make AFK machines. This includes any sort of macro that gives you an advantage over other players. This includes AFK XP Farming. This is bannable! For ex: An AFK fishing macro. 13. No Scripts, DDoSing or Dox'ing of any kind in our server. Any sort of threat made to any player or to the server, it will result in a permanent ban. 14. All Automated Machines must be turned off BEFORE you log off. Any left on will result in an admin forcibly turn your machine(s) off and may result in a Temp ban. 15. You are responsible for your actions accidental or on purpose (of course this is very situational). 16.You must clean up your entities on the server. Examples of Entities are: Dropped items, Mobs, Animals, etc. 17. If an Admin Situation arises and questions are asked, you answer truthfully and as soon as possible. 18. No exploiting anything. if its not suppose to happen then don't do it. (ex. glitching, glitching on the roof of the Nether, etc.) 19. If you lose an item, it is gone. We do not refund items lost because of bugs, glitches, crashes, ClearLag, restarts, death, or other silly reasons. You must abide by these rules no matter your rank within ADK. -------------------------------------------------------------------------------------------------------------------------------------------------------------------------------------------------- PVP-Specific Rules 1. Both Parties MUST agree to in order to PVP. However, Staff are not responsible for any "foul play" unless PVP hacks are involved. 2. If a specific PVP world is available, you automatically agree to PVP by joining that world ----------------------------------------------------------------------------------------------------------------------------------------------------------------------------------------------------- Important Notes: - We reserve the right to revoke a rank if we feel it is proper punishment, so donators should keep this in mind when faced with decisions. - If you see anyone doing something they shouldn't and there are no staff members around to resolve the situation, please make a player report on our forums. *These rules are subject to change without any notice. Its that time again! Join me tonight Saturday August 4th at 8pm cst to blow up the Vanilla Minecraft Server! Its always a ton of fun! I hope to see you all there! 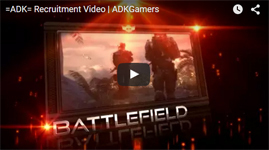 @OurHealer Welcome to The ADK Gamers forums! Its nice to meet you! I noticed your from Michigan. I grew up 25 mins north of Detroit! I live in Iowa now tho! I hope you have a great time here! Hello @Tacotown21 Very nice to meet you! I hope you enjoy your time here If you need anything please ask! The Minecraft Staff is please to announce a new event! We have had lots of discussions back and forth about what we would like for the spawn area in our Revelations server! Brassy usually builds our spawns but she decided she would like all of your help. Join us this Saturday July 14 from 12 noon cst to 12 midnight cst Everyone needs to show up with ZERO armour, ZERO tools, and a completely empty inventory! Greg and I will put you into creative mode. Once at spawn in the mode you will need to stay at spawn. Once the event is over your inventory will be wiped. The theme we decided on is a Medieval times town ( Castles, Moats, Cottages, Small markets, Tavern ect.. ) Please keep in mind anyone caught using creative to advance in the game will be subject to immediate removal from the server and/or community! Nice to meet you @TheProdigyTMx Devon! Hope you stay around awhile! Hi @avacadoboki Its nice to meet you If you play League of Legends you should get with our staff for that section they are @Seagull @Huskay @Bobby and @DeaDxPooL90 I hope you enjoy your time here!